On Sunday, March 15, 2015, officers from the Los Angeles Police Department pulled a homeless man from his tent in a section of Los Angeles known as Skid Row. What happened next is still up for debate. 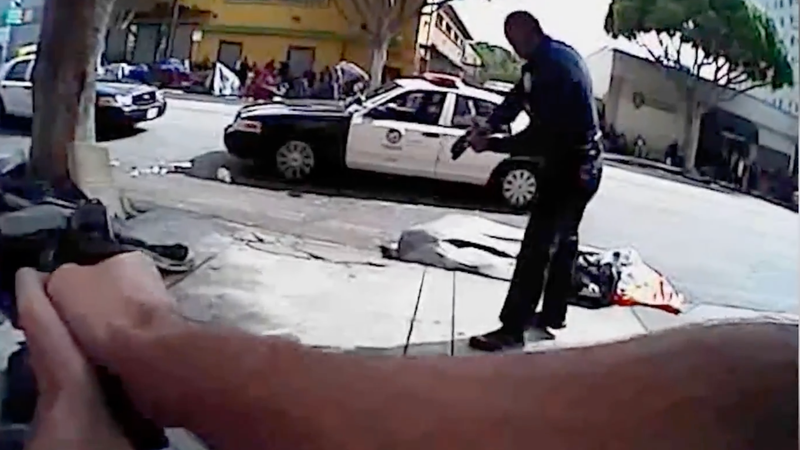 An officer of the LAPD shot and killed Charly “Africa” Keunang. It seems like it would be an easy thing to clear up. At least three officers on the scene were outfitted with body cameras that captured the incident. But for three years the city of Los Angeles refused to release the footage, until the Los Angeles Times, after a lengthy court battle, obtained the videos from those bodycams on Tuesday. Martinez’s partner, Joshua Volasgis, punches Keunang “two, three times in the facial area,” he tells investigators, according to Jeff Sharlet of GQ magazine, who reviewed the footage and the police reports. Then an officer raises his gun and shoots Charly Keunang. The officers look for Volasgis’ gun in Charly’s hand, but it is not in Charly’s hand. It is not on the ground. It is not in the tent. The gun is still in Volasgis’ holster. The LAPD released an “enhanced image” from another officer’s camera that supposedly shows Keunang grabbing an officer’s weapon, although the family’s attorneys say that they cannot see it. Eleven months later, a closed-door hearing conducted by the Los Angeles Police Commission would reach the same conclusion: that Keunang died after grabbing a policeman’s weapon. City prosecutors would never file charges against the officers. Charly “Africa” Keunang is dead. He would be approximately the 175th person shot and killed by police in 2015, according to GQ magazine. Police would shoot and kill 820 more people that year; 259 of them would be black. They would kill 963 in 2016. They would kill 987 in 2017.